Our clean, modern three bedroom/two bathroom full service lodge easily accommodates six hunters comfortably. You can relax in a recliner in the living room watching your favorite NFL team play on the flat screen satellite TV, or catch up on emails and business with our free Wi-Fi service. If you are in the mood to unwind with a cocktail after your hunt, you’ll find your fridge stocked with complimentary soft drinks, water, juices and ice for your convenience. Or come relax outside and sit out on the front deck enjoying the phenomenal hill top panoramic view where you can see Canadian nature at its finest. Many of our clients have had the pleasure of seeing the numerous moose and deer that pass through our yard each year and love watching the large flocks of migrating birds flying overhead. Before and after each of your hunts you can enjoy the convenience of a well set up garage area to clean your guns or simply recall your favorite moments from the day’s events. 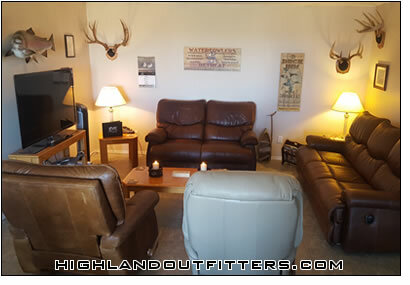 With lots of space to store all your hunting gear, a radiant heater, tables, gun cleaning products and utensils, a gun rack, chairs, a stocked fridge and little extras like a boot dryer, you’ll find the garage “man space” is very useful as well as a nice plus of staying with Highland Outfitters. In addition, you will have daily room service and home cooked hearty breakfasts each morning. Our professional caterer prepares you delicious suppers featuring local foods such as Barrich potatoes, garden vegetables, home-made buns, tasty salads, and delicious desserts like home-made fruit pies and cheese cakes. Bring your appetite; join your friends and the staff at our spacious 14 person oak kitchen table where more often than not we will all have a good laugh before the meal is through.